Shanghai, China – Kwantlen Polytechnic University (KPU) and the Beijing University of Chinese Medicine (BUCM) have made history. KPU and BUCM signed a Memorandum of Understanding this week to develop a framework that will allow graduates of the Canadian university’s brand new acupuncture diploma program to transfer into year four of BUCM’s five-year Traditional Chinese Medicine degree program, achieving both a diploma in acupuncture from KPU and a degree in TCM from China’s top university in the field. This will be the first transfer agreement between BUCM and a North American public post-secondary institution. “This moment is so many things for us – it’s historical, it’s thrilling, and it’s a major achievement for the two leadership teams from KPU and BUCM, but most of all it’s a once-in-a-lifetime opportunity for graduates of KPU’s acupuncture diploma program,” said Dr. Alan Davis, president and vice-chancellor of KPU. BUCM President Xu Anlong called the MOU a significant achievement. Upon their return to Canada, KPU students who complete their degree at BUCM will be eligible to seek registration and membership with the College of Traditional Chinese Medicine Practitioners and Acupuncturists of B.C., and start their careers as full TCM practitioners. “By choosing to further their studies at BUCM, KPU's acupuncture diploma graduates will expand their knowledge of TCM to include massage, herbology, dietary therapy and other important TCM-related studies,” said Dr. Salvador Ferreras, KPU’s provost and VP academic. Ferreras and Stuart McIlmoyle, KPU’s associate VP of international education, traveled to China in July to finalize various aspects of the MOU with BUCM, a process that began in 2013 after KPU announced it would initiate offerings in Traditional Chinese Medicine. 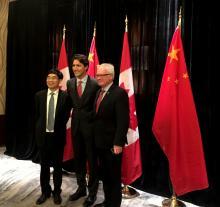 Three years of consultation culminated in the signing of the MOU on Sept. 1 during the official visit to China by Prime Minister Justin Trudeau. Canada’s Minister of International Trade Chrystia Freeland was also on hand at the signing ceremony. KPU and BUCM will now work to develop criteria for admission and academic credit transfers in time for KPU’s first cohort of acupuncture diploma alumni in 2018. The first program of its kind at an established public post-secondary institution, KPU is launching its two-year acupuncture diploma program this September. Comprising 86 credits and 460 hours of clinical practice over six semesters, students learn fundamental theory, diagnosis, treatment and clinical practice. A photo from the MOU signing ceremony is available for download from Flickr. Making history… Kwantlen Polytechnic University (KPU) President and Vice-Chancellor Dr. Alan Davis (right) and Beijing University of Chinese Medicine (BUCM) President Xu Anlong (left) joined Canadian Prime Minister Justin Trudeau in a celebration of a new Memorandum of Understanding between KPU and BUCM. Founded in 1956, Beijing University of Chinese Medicine operates under the direct leadership of the Chinese Ministry of Education. It is the top university of Traditional Chinese Medicine in the country, and one of the earliest established institutions of higher learning in Traditional Chinese Medicine approved by the State Council of the People’s Republic of China.